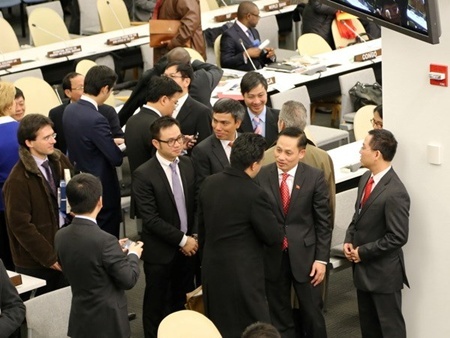 Viet Nam's Universal Periodic Review (UPR) Report in the second cycle will be reviewed at a session of the United Nations Human Rights Council (UNHRC) on February 5 in Geneva, Switzerland. An outcome summary of the report will then be published on February 7. A Vietnamese delegation to the event will be led by Deputy Foreign Minister Ha Kim Ngoc. They will present Viet Nam's achievements in undertaking its comprehensive renewal cause, promoting social equality and safeguarding human rights. They will also talk about the country's successes in pursuing an open, sincere and constructive policy on external relations, even when there is a difference in viewpoints, to seek ways to enhance mutual understanding. Viet Nam's UPR Report in the second cycle was officially submitted to the UNHRC's Secretariat on October 31, 2013. It was compiled by 18 ministries, sectors and agencies of the National Assembly and Government and participated by other stakeholders like socio-political organisations, local and foreign non-governmental organisations, the media and the public. Apart from screening the outcomes of the execution of accepted recommendations, it has also presented the existing challenges and the Government's priorities in improving the implementation of human rights. Vietnam first undertook the UPR mechanism in May, 2009 during which it received 123 recommendations and accepted 96. The accepted recommendations - covering the completion of a system of law and policies related to human rights, poverty elimination, economic development, social welfare, job generation, education and healthcare- have been implemented by 17 ministries, sectors and governmental agencies. The country has proactively participated in international activities on human rights at UN agencies and forums to which it is a member. It made active contributions to the affairs of the Human Rights Committee (2001-2003), the Socio-Economic Council (2000-2002), the Social Development Committee (2002-2004 and 2012-2014), and the UN Security Council (2008-2009). On November 12, 2013, Viet Nam was elected to the Human Rights Council for the first time, the recognition by the international community for its recent achievements in exercising civil, political, economic, cultural and social rights.